ICA is a supporting partner of the Year of India in Canada 2011 initiative. 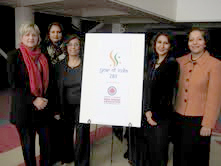 An initiative of the Government of India, "Year of India in Canada 2011" is a year of cultural events, literary workshops, seminars, trades shows, and other public events across Canada. Regina has been chosen by the High Commissioner of India in Canada as one of only eight participating cities. The initiative was launched in Saskatchewan at an ICA-hosted press conference held in Regina on 15 December 2010. The official kick off of the year-long initiative will be in March 2011 with the first of the series of Saskatchewan events. "Year of India in Canada 2011" is intended to help celebrate the bond between India and Canada and foster intercultural understanding. The Regina events are an opportunity to reinforce the connections between the citizens of Saskatchewan and India. Events taking place in Regina will be posted on our calendar. To see what events are happening across the country, check the pan-Canadian calendar updated regularly. The High Commissioner of India to Canada announced at the 2009 ICA Supper Night an initiative whereby Government of India wishes to celebrate a "Year of India in Canada” in 2011. India and Canada share many values and beliefs. A joint declaration between the Prime Ministers of India and Canada in New Delhi, India in November 2009 is a testimony to that. This initiative will help reinforce this strong bond between the two countries and foster better understanding between citizens of Saskatchewan and India. The “Year of India in Canada 2011” initiative has garnered support from all levels of governments – including those of Saskatchewan and Regina – and countless other partners. The President’s Office of the University of Regina has also lent its full support to this initiative since it coincides with the institution’s own related Celebrations.